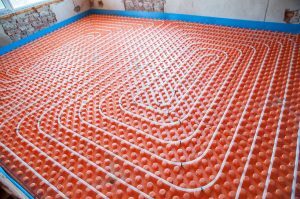 Radiant heating systems entail the installation of tubes or coils beneath the floor, through which heated water or some other means of heating is circulated. Pumps are used to circulate the liquid through the tubes, while some systems use electrical coils to provide warmth instead of tubes. The heat from the system warms the room directly through the floor: moving gently through furnishings and your own feet to provide safe, comfortable warmth. Efficient Heat. Forced-air furnaces and similar heating systems warm the air around us in the winter. It works, but it’s not a very effective means of making us comfortable. Radiant heating systems expend a lot less energy to warm the home and thus cost much less to run. Long Lasting. Radiant heating systems have few moving parts beyond the pumps used to circulate the liquid and are protected from damage by being placed beneath the floors. As a result, they tend to last a long time and don’t suffer from breakdowns often. No Breeze. Forced-air furnaces can create a number of issues when they circulate the air. Drafts, for instance, can be common in homes with forced-air furnaces, and the blown air can circulate things like dust and germs: lowering the quality of your indoor air. Radiant heating systems eliminate that problem entirely, without skimping on the warm, comfortable temperatures you need. Fast Response Time. When you turn on a regular heater, it often takes time to warm up. That isn’t the case with a radiant heating system. Not only does the warmth arrive quickly, but the reduced “start-up” time further improves the system’s efficiency: putting money back into your pocket. If a radiant heating system sounds like a good fit for your Westlake, OH home, call Westland Heating & Air Conditioning today!